Let’s get right into it. How to set up Flutter for the first time with Android’s SDK up and running. 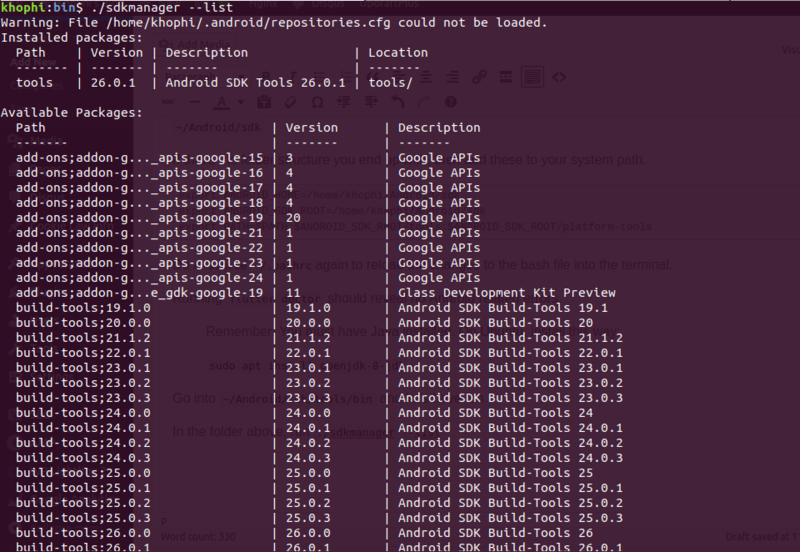 We’re only setting up Android’s SDK. No Android Studio. If you wanna learn the installation of the Studio, this ain’t the place for you. We’ll be using the SDK for command line only. First of all, clone flutter. I choose to have my Flutter setup in the ~/.flutterSetup hidden directory. Note, you might wanna save yourself from downloading the relatively big Flutter repository. Simply clone with a depth of 2 or 3, to download a relatively smaller working repository. Next, add flutter to your system variables. nano ~/.bashrc and add the text below to the bottom of the file. Do source ~/.bashrc to reinitialize the terminal with the changes to the .bashrc file. Follow any prompts that might show up, and resolve accordingly. ✗ Downloaded executables cannot execute on host. You know what to do from the above. If you don’t have Android installed, Flutter doctor will diagnose the disease caused by the Lack of Android. If that’s the case, follow the step below to install Android’s SDK. If that’s the folder structure you end up with, then add these to your system path. Do a source ~/.bashrcagain to reload the changes to the bash file into the terminal. Running flutter doctor should reveal no Android related errors. Go into ~/Android/sdk/tools/bin and let’s have fun. Naaa. Just the handiwork of great minds. Let’s enjoy the fruits of their hard work. This part is necessary, unless you always would connect your physical android phone to your machine during development, when you have ADB enabled and connected to your computer. But with Android Virtual Device, you could have the Android Phone simulation happening right on screen. Pretty handy. ./avdmanager create avd -n khophi -k "system-images;android-27;google_apis;x86"
The system-images should be what you’ve already installed in the previous step. You might get some missing/not found error the first time. Re run the command, and all should go well. These are the steps I go through in setting up my Flutter & Android SDK Command Line anytime I do a new system install. Currently using Ubuntu 18.04 LTS. However, I’ve left some troubleshooting steps below as some of the errors I came across in the process and how the internet helped me get it fixed. You might come across a few errors here and there. Below are some I came across and how I fixed. Then add your user to a user group that’ll be created as a result of installing the above things. Reboot your computer. Re-login is suggested, but didn’t work for me. My GUI got messed up somehow. Only resumed only after actual reboot. If you’re not able to press the power button continously to shutdown because you’ve enabled it for suspend, simply use the Ctrl + Alt + F1/F2/F3to open up a terminal at the broken session login screen. You know what to do henceforth.